Keiko and Taku Shinomoto have two simple rules for their store: that the items come from Japan and that they have been well made by artisans. 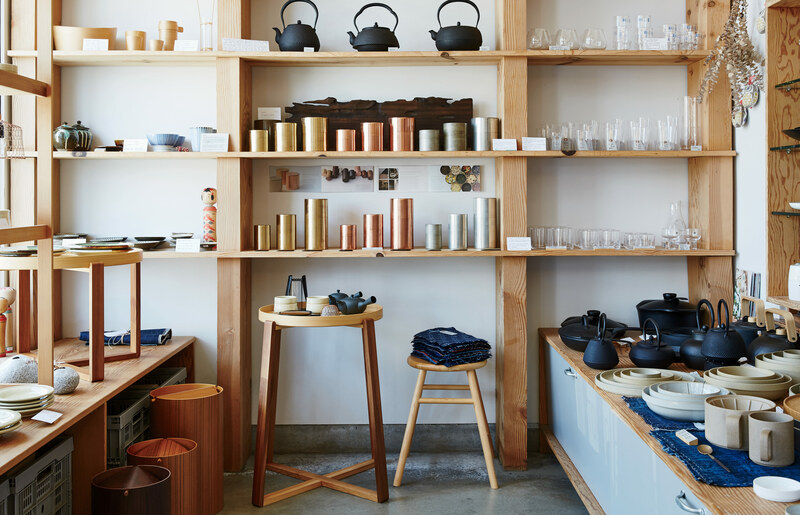 Just off busy Abbot Kinney Boulevard in Venice, California, the shop carries homewares such as Kaikado metal tea canisters. Tucked behind Tortoise General Store is Tortoise, a gallery-like setting where designs from Ryota Aoki, Hiroto Nakanishi, and Masanobu Ando are on display. Each of Aoki’s pitchers is one of a kind. A corner of the store holds baskets from F/Style and Kanaami-Tsuji, cutting boards from Etoetoteato, and utensils from Kohchosai Kosuga. Taku Shinomoto designed the Hasami porcelain pieces, which are stackable and based on oju, or traditional Japanese lacquerware. Keiko and Taku Shinomoto (with Fido—pronounced FEE-do) stand outside Tortoise, which is set off by a small outdoor courtyard. Keiko and Taku Shinomoto, who moved to Los Angeles from Tokyo in 2003 to open Tortoise General Store, share their thoughts on offering the best from Japan. Please describe the general philosophy behind your store. In short, long and steady. A turtle, or tortoise, is the symbol of longevity— along with a crane—in Japan. We like to introduce merchandise that has existed for a long time, has been created using traditional techniques, or is something we expect to last and please people in their daily lives. How do you source your wares? We rely on our rich network of people in Japan, which allows us to source items from various regions. We also spend about 60 days per year in Japan, which helps us gather current information. Obviously the fact that the pieces are made in Japan is crucial, and we try to meet with the artist, designer, or manufacturer in person as much as possible to learn and understand their backgrounds and processes. How does a brick-and-mortar shop survive in the digital age? In the modern world, stores like ours exist to play the role that the digital stores are not capable of playing. The more global the online stores become, the more the importance of unique brick-and-mortar stores increases. People’s preferences will tilt toward local directions as the world becomes more global. We want to keep providing the joy of discovering things that you never knew you liked, by coming to the store and touching, interacting, and communicating. What are some obvious differences between the shopping and buying patterns in Japan and the States? The most obvious difference is that the consumers in Japan make purchases that are often determined by elements outside of the product itself, and here, the consumers make decisions with less preliminary knowledge about the product or the artist. In Japan, practical items such as rice bowls and cups sell well, but in the United States, decorative items like vases and sculptures sell, which surprises the artists. Japanese people are very sensitive to reviews by the media and the name value of the designers, which doesn’t always lead to popularity in the USA. Even the most well-known artists in Japan are still new to the American market, so when it comes to selecting the artists, it is important to distinguish the power of the piece itself.